Elder Dale G. Renlund was sustained a member of the First Quorum of the Seventy of The Church of Jesus Christ of Latter-day Saints on April 4, 2009, at age 56. 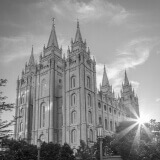 At the time of his call, he had been serving as a member of the Fifth Quorum of the Seventy in the Utah Salt Lake City Area. He is currently serving in the presidency of the Africa Southeast Area. Elder Renlund has served in numerous Church callings, including full-time missionary in Sweden, stake president, high councilor, bishop, and Area Seventy. Elder Renlund was born in Salt Lake City, Utah, on November 13, 1952. He married Ruth Lybbert in 1977. They are the parents of one daughter.